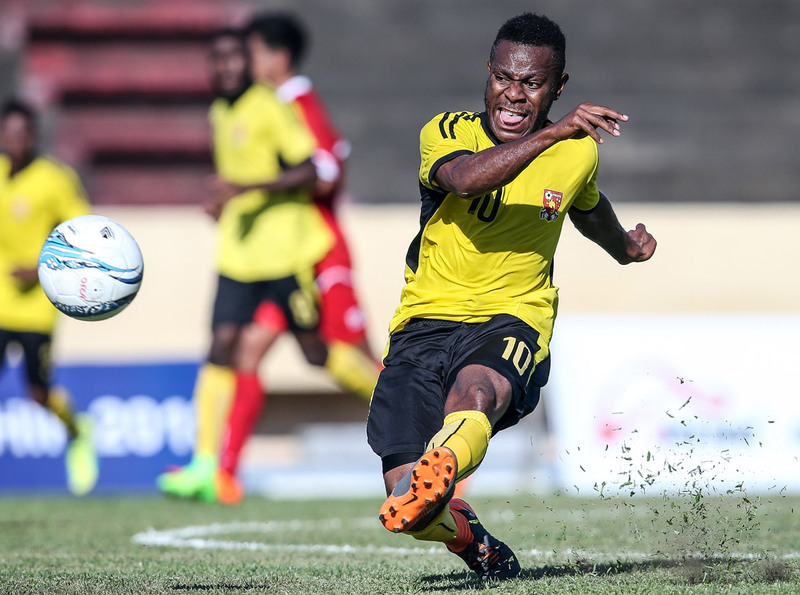 Papua New Guinea made a strong start to their OFC U-19 Championship campaign this afternoon as they outplayed a determined Tongan side to claim a 4-0 win in the opening game of the competition at Stade Pater. In the late match the hosts Tahiti were unable to contain the might of defending champions New Zealand despite a strong showing, going down 2-1 in front of a vocal home crowd. As expected this was a hotly contested encounter with Tahiti determined to redeem themselves after a forgettable U-17 campaign at home in 2017. The home side started strong pressing their opponents, putting them under pressure and flustering them somewhat with the hard and fast manner with which they took to the game. However New Zealand’s experience soon shone as they settled into the match and started passing the ball around the park and had a couple of decent runs at goal through Max Mata and Charles Spragg but they couldn’t quite get the final touch they were after. Tahiti meanwhile opted for a more direct approach when in possession, long balls searching out Eddy Kaspard and advances up the flank by Yann Vivi looking for a finish in the middle which wasn’t forthcoming – at least in the first half. Shortly after the restart New Zealand had the break they needed when a handball in the penalty area saw Solomon Islands referee George Time point to the spot. Max Mata stepped up to take, sending Moana Pito diving to the left as he slotted past the keeper’s feet to the right in the 53rd minute. Less than ten minutes later a scramble on the goal line following a corner saw Charles Spragg put his name on New Zealand’s second goal of the night. Tahiti hit back almost immediately through the hard working Kaspard who fired an absolute bullet past Cameron Brown from the top of the box to open his account. New Zealand coach Des Buckingham was pleased to get an opening win under his belt especially given Tahiti took his side to task throughout the 90 minutes. “As I said in the press conference, all the teams are well prepared and you can see the work that Tahiti has been doing over the past nine to 12 months. “They’re very organised and were very unfortunate not to get something out of the game. But very prepared by us also, and I think we deserved to win,” Buckingham said. “I think a lot of people look past the first game and look further forward but the first game is important for us. We knew we were taking on the host, we knew the prep that had gone in for those guys and we hadn’t looked past that. While a loss wasn’t exactly the result Bruno Tehaamoana had hoped for this evening a strong, confident performance from his side meant he won’t be going home disappointed. “Congratulations to New Zealand first of all. But we aren’t disappointed. We showed that we are here,” he said. “There were two small errors, the penalty and corner, where we conceded the two goals but we responded pretty quickly and kept pushing and pushing, but New Zealand were stronger than us today. Tehaamoana said the most positive outcome for Tahiti’s U-19s tonight was the cohesion they showed on the pitch. Earlier in the day it took Tonga a little time to settle into the match as they adjusted to the pace of the competition, but they were soon able to surprise with an approach many hadn’t expected from the Qualifier winners. At times sitting back and inviting the pressure from their opponents relying on the defensive structure they built up during the qualifying stage, Tonga were able to then counter using the speed of Tevita Kau and Talakaua Faiva’alo to their advantage. Papua New Guinea, although dominant in possession, struggled to adjust to the Tongan’s solid approach to defending their goal mouth and it seemed like they may not be able to break them down. The frustration crept in as Papua New Guinea picked up two cautions in the first 20 minutes before they started to settle and create chances for themselves. The best opportunities were created by Barthy Kerobin who really put Semisi Otukolo to the test with some quick-fire shots. However the honour of the opening goal of the tournament fell to Jonathan Allen who latched onto the ball and fired it under Otukolo in the first minute of added time. Kerobin finally got on the score sheet himself in the 66th minute when he broke the line to latch onto a through ball before calmly slotting past Otukolo. Substitute Abraham Allen then made took Papua New Guinea’s lead to three in the 72nd minute before getting his brace in added time to complete the 4-0 victory for his side. Papua New Guinea coach Harrison Kamake said although they never underestimated their opponent, they hadn’t expected the high pressing approach the first half of the match delivered. “I would say we were a bit nervous during the first-half,” he said. “The instruction was just to stick to the plan, carry out what we were supposed to do and we started to pick up in the second half. Tonga coach Soane Mailangi was happy with the overall performance from his side as they made the first step up to this level. “Before we came up to this tournament we knew every game was going to be really tough because most of the teams in the top are hard for us to play,” Mailangi said. “Today we compacted our defence, worked hard at the back and when we got the ball counter-attacked and tried to send long balls. We knew Papua New Guinea would be physical, quick but short and we tried to use that. The OFC U-19 Championship moves to Stade Fautaua in Papeete, Tahiti tomorrow as Group B get their campaigns underway.